Home > Recycling > Why Recycle? The U.K. deposits around 100 million tonnes of waste in landfill. This waste, not only requires transport to the landfill site, which in itself produces harmful carbon emissions, but also produces further harmful gas emissions during the degradation of waste. These harmful emissions are largely responsible for global warming. Not recycling directly contributes to the further damage of our environment. The government has committed itself, both as matter of stand-alone policy, and as part of wider E.U. and U.K. initiatives, to cutting fuel emissions. Recycling household waste features as a major part of this policy. The government has set targets to recycle and compost 30% of all household waste by 2010 and 33% by 2015. The Goverment's targets for recycling and composting in 2005/2006 were set at 25% of all household waste, which was exceeded, with an overall average of 26.7%. Garden waste accounts for around a fifth of all household waste. It may be biodegradable, but it takes up a large amount of space in transit and contributes to the build up of gases emitted from landfill sites. Garden waste can be easily and effectively recycled as compost (see related article). The composting of garden waste and biodegradable kitchen waste would significantly contribute to reaching government targets. The recycling of all other recyclable waste, depending on local facilities, would make it possible to exceed current targets easily. Pilot schemes are under development to make the recycling of waste mandatory. Under one such scheme, which is now underway, household waste is monitored by weight. Penalties can be applied to householders who throw away too much waste. With the government encouraging local authorities to take their own steps to meet recycling targets, schemes such as these may become commonplace. Such mandatory schemes, which can be considered a invasion of liberties, may be avoided if people take it upon themselves to recycle without obligation to do so. If mandatory recycling schemes become commonplace, there will be a satisfaction in knowing that recycling is already part of your daily routine. Lobbying their local M.P. to improve facilities for recycling locally. Developing an awareness of the importance of recycling amongst peers, through a promotion of the positive benefits of doing so. Volunteering to run a recycling programme in the workplace, if there is not one in place. Such schemes are invaluable to a company's public image, as well as being helpful for the environment. 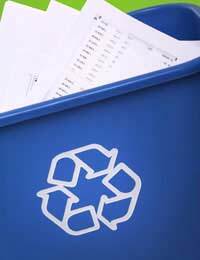 For further information of how to recycle household waste see related article. How do I Get Rid of...?